In the Igbo language of Nigeria, "Osimili," the title of Nnenna Okore's recent show, means a huge body of water. Okore, who spent most of her childhood in Nigeria (she was born in Australia), is now a professor of art at North Park University in Chicago. After graduating from the University of Nigeria in 1999 with a BA in painting, she received her MA and MFA from the university of Iowa in 2004 and 2005. In 2014, she returned to Nigeria on a Fulbright grant, and her work continues to reflect that country's culture and environment. 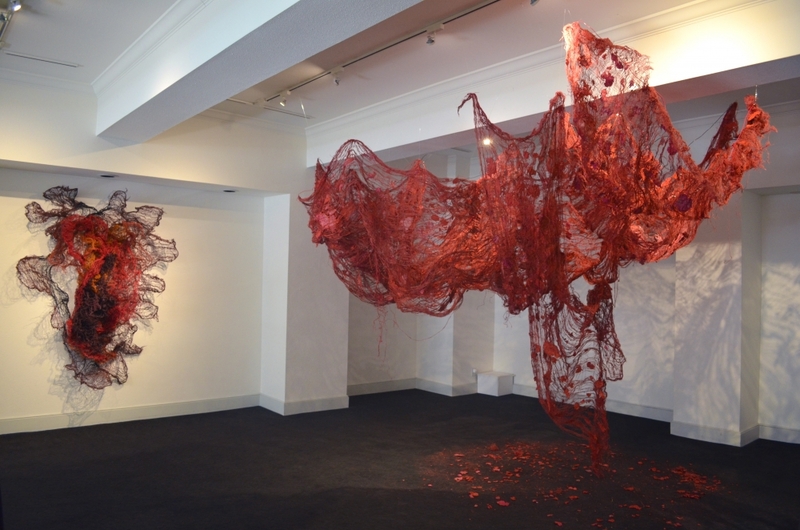 She uses wire to shape and join fabric forms, creating malleable and changeable sculptures with multiple parts that relate to the site of their installation. These works bear a certain relationship to those of her teacher, El Anatsui, possibly Nigeria's most famous contemporary artist, known for his large-scale draping sculptures made with discarded aluminum bottle caps sewn together with wire. In this show, Okore's works – all related to the movement of water and life forces – were mounted on white walls to form multi-part and singular installations. Her materials, all of them commonplace, are recycled, including burlap (perhaps from agricultural bags), wire, and dye. Sometimes silver wire shines through the twisted, frayed, and tattered burlap, intermixed with colorful, projecting bits of yarn, thread, and raw fibers. The fabric becomes net-like, with irregular negative spaces casting intricately patterned shadows. The reconfiguring of these discards requires labor-intensive processes. The materials may be recycled, but they are so disguised that one cannot find much reference to their past lives. Okore likes to stress the burlap, unraveling ends and twisting and manipulating forms to leave an open-weave surface that undulates over the walls and produces dramatic effects. Some pieces resemble blooming flowers or starbursts, reminiscent of fireworks with brightly colored, exploding forms radiating out from a center against a black background. Okore seems to prefer deep black and red, with interspersed bits of orange, green, and blue. Reflecting fragility, decay, and ephemerality, Okore's sculptures reference the feminine with their use of fabric and processes such as stitching and weaving. They may seem a bit frilly and decorative, straddling the line between craft and fine art, between abstract and figurative, yet their intriguing organic forms and bold colors have a strong impact.